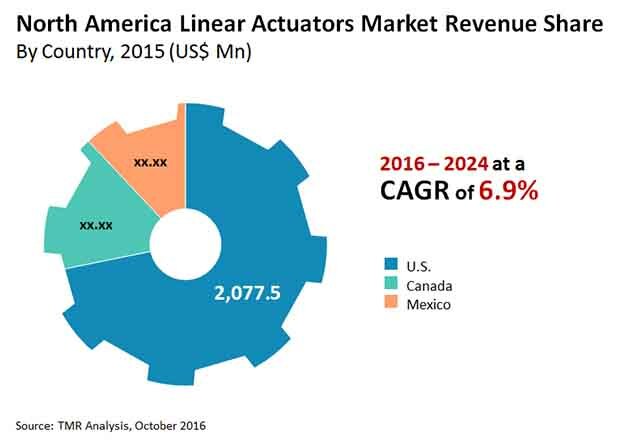 The North America market for linear actuators is chiefly driven by the rising adoption of automation across a number of industries, an increased focus on wastewater management, and the flourishing aerospace and defense industry. An exponential rise in shale gas exploration activities in the region is also expected to levy a significant positive impact on the market’s overall development in the next few years. This report provides strategic analysis of the North America linear actuators market, and the growth forecast for the period 2016 to 2024. The scope of the report includes competitive analysis of various market segments based on type, end use, and in-depth cross-sectional scrutiny of the North America linear actuators market across countries. Linear actuators refer to actuators which creates linear motion of a machine part or the machine itself. Linear actuators have varied applications, such as in linearly actuated valves, pumps, industrial machinery, vehicular brakes and computer peripherals among others. They can have a very simple mechanism of action, or can be very complex. Growth in industrial automation, across verticals such as automotive, food & beverage manufacturing, pharmaceutical manufacturing, healthcare and defense among others, has been the primary driver of the linear actuators market in North America. The increasing importance for water and wastewater management has also been boosting the growth of linear actuators market. Increasing population in North America has led to increasing demand for efficient water and wastewater management. With stringent environmental regulations and depleting water resources, the government of North American countries has been stressing on improving water and wastewater management systems. Growing demand for various types of linearly actuated valves, for increasing energy efficiency, monitoring of quality of wastewater treatment, and also to meet the changing environmental regulations have been further promoting growth of linear actuator valves in North America. Considering the positive impacts of the factors mentioned above, the linear actuators market in North America can be anticipated to grow at a good pace during the forecast period. On the basis of type, the North America linear actuators market has been segmented into pneumatic, hydraulic, mechanical electric and others. Electric linear actuators have been further divided into ball screw, linear guide, linear table, rod less linear actuator, rod style linear actuator and others. The rod style linear actuator sub-segment has again been divided into helical belt, worm, DC motor and servo motor. The market revenue for linear actuators has been provided in terms of USD million, along with the CAGR for the forecast period from 2016 to 2024. End use industries covered under this report includes automotive, medical/healthcare, furniture, mining, steel, water & wastewater management, construction, it/semiconductor, military, agriculture, chemical, petrochemical among others. Each of these segments provide market size and forecast for the period 2016 - 2024, highlighting the key trends influencing and challenging factors for each segment. The country wise market analysis gives in-depth analysis of the current trends in different countries including the U.S., Canada and Mexico. To aid in strategic decision-making, the report also includes competitive profiling of leading players in the industry, their market share, various business strategies adopted by them, and recent developments. The key trends analysis and market opportunity map provided in the report discusses the various upcoming trends and current end use industries, with a focus on the future penetration of these products. The market opportunity map and market attractiveness analysis included in the report provide insight into market dynamics, industry competition, and the most profitable segments in the North America linear actuators market. Additionally, the Porter’s five forces analysis aids in better understanding of the level of competition present in the market. Top players of the North America linear actuators market has also being profiled and included in the report. The report also provides breakdown and assessment of various factors impacting the market growth, which are suitably described as market drivers, restraints, and opportunities. These factors determine various existing trends and their impact on market growth. Overall, taking into consideration the various factors affecting the linear actuators market, the report includes a holistic analysis of the North America linear actuators market, and provides an estimate of growth for the forecast period 2016 to 2024. Some of the leading players in the market are Kollmorgen (U.S.), Tsubakimoto Chain, Co. (Japan), DESTACO (U.S.), Enerpac (U.S.), Duff-Norton (U.S.), Joyce Dayton Corporation (U.S.), MOOG, Inc. (U.S.), PHD, Inc. (U.S.), General Electric, Co. (U.S.),NOOK Industries, Inc. (U.S.),Altra Industrial Motion, Corporation (U.S.), Parker Hannifin Corporation (U.S.), Festo Group (U.S.), Tolomatic, Inc. (U.S.),Rockwell Automation (U.S.), IAI America, Inc. (Japan) Fortive Corporation (U.S.), RACO International, L.P. (U.S.) and Curtiss Wright Corporation (U.S.) among others.